I struggle with postures that are part of literally every yoga class (sigh…). Granted, I can do a headstand, handstand, forearm balance, I can jump back into plank from crow pose… And while that all looks nice and fancy, it’s not really the purpose of a consistent, balanced yoga practice. And indeed, I’m usually the first one who starts shaking in any of the warrior postures. Oh, and chair pose? Please, my legs are burning, can we skip it? Of course the issue is my lack of lower body strength. All postures requiring upper body strength came to me easily, but my legs have always been weak. No amount of practice seemed to be able to fix this, and my body always felt somewhat imbalanced. Lots of Ashtanga yoga has further increased my upper body strength (think of all these dozens of chaturangas each and every day…). And while I maintain that yoga is the perfect method for strengthening and relaxing the entire body, my husband believes that only yoga simply isn’t enough to drastically increase leg strength. Gaining leg strength – the solution? Of course he didn’t mean literally running barefoot. What he was talking about were barefoot shoes, shoes with minimal cushioning and zero drop, meaning that the heel isn’t surrounded by thick padding and is on the same level as the front of the foot. These shoes are built in a way that you’d always land with your toes first, encouraging a “gripping the ground” sensation with your front foot, activating the entire foot, building strength and flexibility (think of the thickly padded shoes as a kind of cast for your feet) – and, the key – therefore activating the leg muscles. You can actually move your toes and your ankle is free to absorb and cushion the shock – the amazing structure that is your foot can simply work the way it was designed by nature. Doesn’t sound like much, right? I mean, come on, I’ve been walking for over 30 years, how can walking or running with these shoes make such a radical difference? Well, I started with 30 minutes and was unable to walk properly for a few days. I then switched back to 10-15 minutes barefoot walking, and built up to 1.5 hours afterwards, very slowly and gradually. Was it worth it? Definitely. My standing postures improved heaps, and I’m now able to hold warrior postures and chair pose just as long as most others in yoga class. I also gained stamina and my body feels more balanced overall. What’s the downside? Well, if there’s one, it’s the loss of flexibility. Unless you’re stretching properly after your barefoot walk/run, your muscles will tense up. Not much, and if you’re not a keen yogi you probably won’t feel a huge difference, but if you’re used to doing crazy pretzel like postures you will really notice a physical shift. 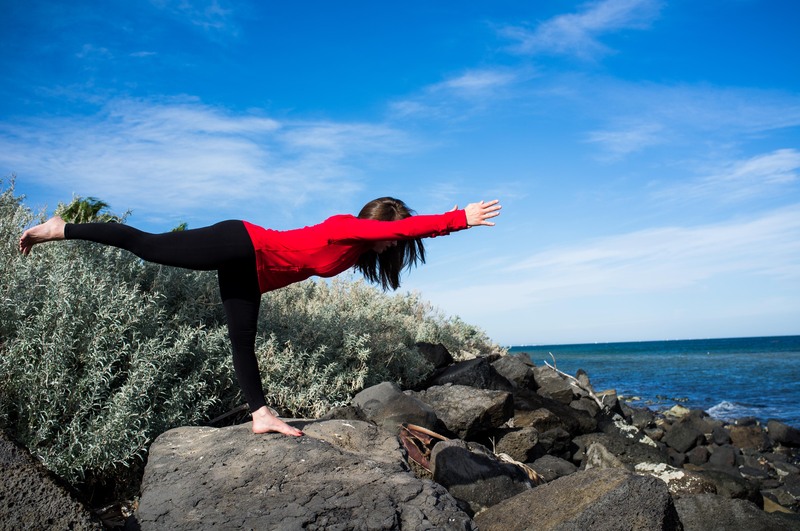 Virabhadrasana 3 – Leg, leg, leg strength! So where do you get barefoot shoes? I’ve started with Merrell (purely because my husband swears by them) and have been using them for over a year now. There are other brands but what I like about them is that you’re able to find women’s shoes that are not pink or purple! 🙂 If you’re thinking of barefoot running or walking but aren’t quite sure yet, there are also a few shoes that are designed as ‘transition’ shoes, with a bit more cushioning, but still the zero drop that encourages landing on the balls of your feet. I live by the sea as well, we are so lucky! 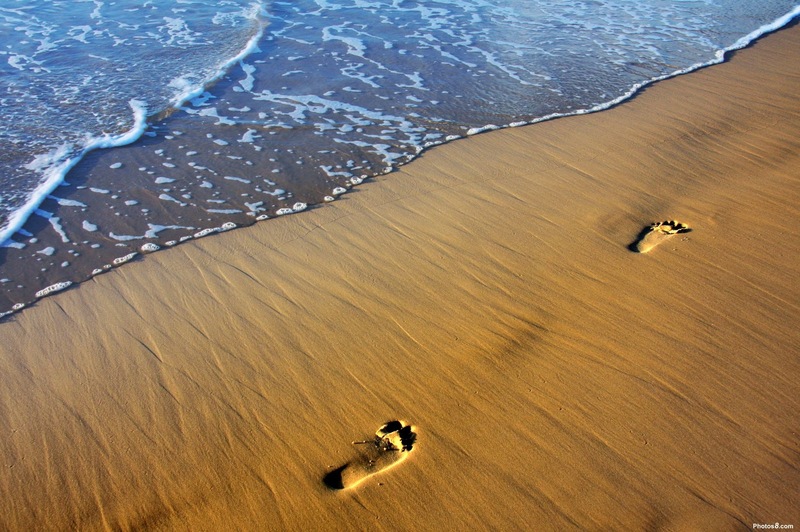 Walking in the sand is such a great way of exercising legs and feet! I’m exactly the same. It’s not just the strength that kills me, it’s the balance. I have better balance upside down than right side up. I used to run but I stopped recently because it was getting in the way of yoga. I couldn’t fit my full time job, yoga, my family and running into my schedule. I ran a half marathon last year and it STILL didn’t help me dread Chair pose (my least favorite, along with Camel) any less. My quads just ain’t havin’ it in any of these poses. The one thing that has helped has been going regularly to all levels classes where the focus is on the more basic poses. Doing at least five Sun B’s in every class (5 times a week) has done wonders for my quads. The problem I’m having now, though, and maybe you have so insight into this, is that I’m ALWAYS sore. It’s part of the reason I stopped running – I don’t want to do anything that will make me too sore for yoga! Does that ever happen to you? And what do you do about it? Haha, of course, it happens all the time. I usually go for a yin type of practice, with long, deep stretches that promote relaxation (I love yin generally but particularly when my body feels drained). I also stopped doing yoga and runs the same day, it’s just too much for my body. However, I find having a walk in barefoot shoes (30min), followed by a 45min soothing yoga session – with a few challenging postures thrown in – gives a great balance. Check it out, you may find some tip there that is just the right thing right now! I have yet to post the next blog on the post, and this reminds me, I’ll get onto it! So I’ve had the opposite problem – my upper body strength was not nearly as good as my lower body. I could rock tree pose for days but I STILL haven’t gotten crow. 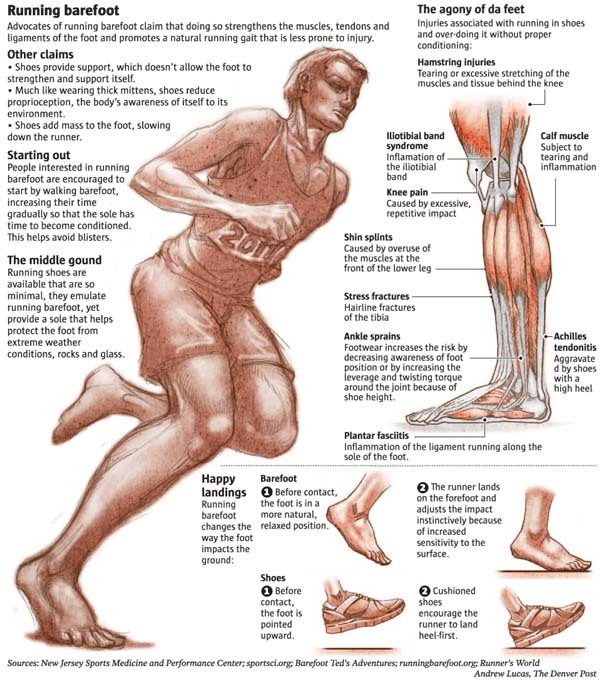 Anyways, I would say that medically, there are concerns with barefoot running so just be cautious of your knees and ankles and hips – don’t fall into the trap of “No Pain No Gain” because sometimes, that pain is really your warning sign that you need to stop! I digress though….I’m impressed with your courage to try something new. For even more leg strength, try a rowing machine. Watch videos on YouTube first of how it’s supposed to look! 🙂 Good luck with your fitness goals! Thanks for your comment – I actually feel like it’s better for my knees and ankles as I land on the balls of the foot instead of the heel. The trouble I had with my knees before got so much better but I had to start really, really slowly, building from 15min to 1.5hrs walks. And you’re definitely right, I don’t subscribe to the “No Pain No Gain” theory: Pain is your body telling you that something is wrong. I’ve heard rowing is the perfect full body exercise, I need to try! I’m also the opposite. I still can’t do a full chaturanga to save my life, and I can’t imagine doing a headstand. But I can stay in a warrior pose without silently pleading for the instructor to move it along (which I always do during an assisted shoulder stand). I’m always so pleased when I hear someone respond well to barefoot shoes as mine have been transformational! I used to wear really thick insoles, on cushioned trainers, with orthotics to support my arches… I remember feeling ridiculous having all this padding – surely just a temporary measure, like a crutch or a brace? I was told to wear this indefinitely. I felt instinctively wrong about it after I saw no improvement in my back and hip pain and switched to barefoot shoes. I personally wear Vivo, just because their shop was local to me. The results have been amazing – my arches are strong, my hips and back don’t have the same problems, and I can walk for the whole day and forget to take my shoes off when I get home because they’re that comfortable! Running definitely requires a change of habit, not just a change of shoe. I think this is sadly where barefoot technology has been misrepresented. If you don’t change your technique and habits as well as your shoe you’re not getting the whole package. As for yoga – my upper body needs more work as I cycle everyday so my quads keep my lower body stronger. I’m sure yoga can provide a full body workout, but it would require careful planning. Nothing wrong with supplementing and having some variety to your exercise routine though! I am wearing Merrill barefoot running shoes most of the time in Ohio. There easier on my back. I haven’t run for awhile. I hope to get back into it, in the spring. No marathons, just some easy running. I found the same, to some degree, until I started really mindfully engaging the muscles towards the bone in almost every pose some years back ( all poses than were active, pretty much) and my leg muscles responded by being stronger. It also really helps you not injure yourself if you engage muscle to bone while stretching. Goodness, I’m the opposite – my legs are strong and my upper body is weak. I really wanted to be able to do a free standing headstand, so I did heaps of downward dog and plank, as well as supported headstand, and gradually I got strong…and now I can do a freestanding headstand 🙂 No luck for hand stand, and I need help to get up in forearm balance…but still, I love how much stronger my arms and thoracic are. I’ve tried both more minimal and cushioned shoes – I honestly find it hard to know what is better. Many people say you need the cushioning because we are running on pavement, and many others advocate for the barefoot type running you describe. I recently went to have my gait evaluated and the shoes that were recommended to me are very cushioned. I think it helps my hip/back because of my stride but now I feel aches in pains in other places. I can’t help but comment on your post. You said you had your gait evaluated and the recommendation was cushioned shoes because of your strides. I think this is where you miss the point of barefoot running/walking. When you walk, your heel is striking the ground first and then the rest of your foot follows and the toes come last. We were never meant to walk or run like this. This is a bad habit we developed since Nike came up with cushioned shoes in the 60s. Striking heel first enabled us to walk/run faster by taking bigger strides. Unfortunately heel first creates a lot of pressure on knees and hips in spite of the cushioning if your shoes. We need to re-learn how to walk/run, that is to say hitting the ground with the ball of the foot first. To do so we need to take smaller but more frequent strides. As Andrea explained it activates different muscles in the legs but removes the excessive impacts and pressure on knees and hips. Yes. I did read that book Born To Run and then tried to adjust my stride to land more on the balls of my feet, but after an SI joint injury last year I worried maybe I had actually been making it worse (im a major overpronator) and so went to have my gait evaluated. As it turns out im decent at it for awhile but when im trying to run faster or longer I move back into old habits. I am the opposite of you, my legs are stronger and my arms weaker. I guess I now know the reason; I ran for 35 years or more. I miss it terribly but I have Lyme disease now which has caused problems with my feet and my stamina. I still do yoga and walk but it is painful. Your suggestion about the shoes is a good one. Maybe some walks with these shoes will give me more flexibility in my feet. Thanks for the tip! Hi, thanks for your comment – the other thing that has given my feet a new life is a spiky rubber ball. You can get it for a few dollars at any sports equipment store and just roll it under your feet while doing computer or reading. I take it with me on every trip, no matter how short! 🙂 i run with Nike Free running shoes… i havent ever used anything else because i have always believed int eh ‘barefoot’ thing and read feverishly about it all long before i started runinng (i started running in July’14). Before that i walked a lot and the running was natural progression. I too need my yoga every week, and do find that the combination of both running and yoga has definitely had cross over benefits!